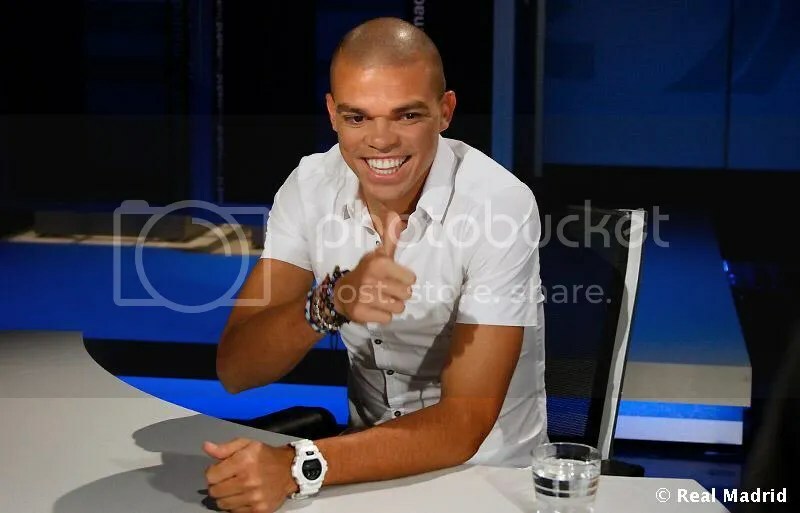 I knew we couldn’t have it both ways… since the Real… interview with Pepe was so fantastic, we had to get multiple pictures of him doing the thumbs-up to balance things out. 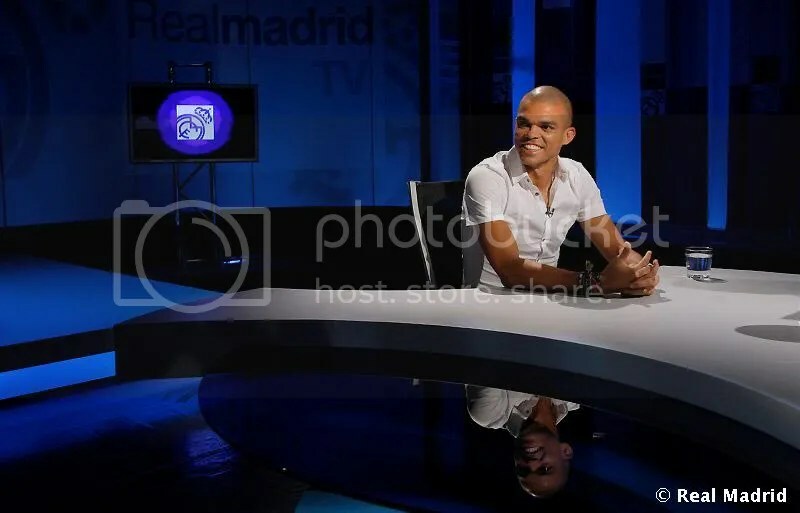 Anyway, I really feel that we got to know Pepe more through this interview, and I only wish the “personal side” section had been longer, and they had touched on his relationship with Marcelo and Crís! And wow, these interviews are getting longer and longer, no? It took me forever to get through it! Or is it just because the non-native Spanish speakers speak a lot slower than their Spanish-speaking counterparts? 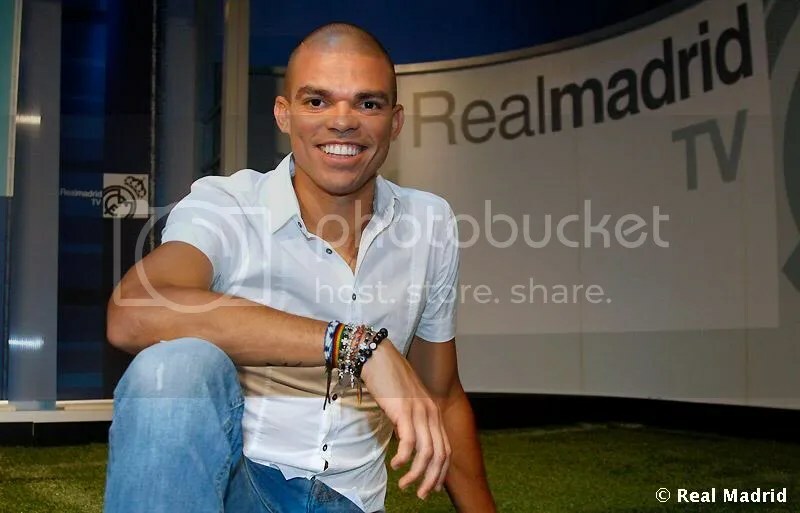 Pepe’s favorite song is “Like U Do” by Chrishan, why this song? It’s a song that inspires me before games, it prepares me for the games and motivates me as well. Today is a very special day for someone close to you, and she shouldn’t be too happy that you’re here with us in RMTV. Today, Sept. 8, is the birthday of your girlfriend Sofía. Yes, it’s true, today is her birthday. For me, it’s a pleasure to be here, sharing these moments with all of you. It’s one more day in her life and one more year that I’ve been with my girlfriend. I hope there will be many more. I imagine that you have prepared something special, because you’re a romantic, no? (Laughs) Well, when I get home, she’ll see what I have for her. It’s something simple, but I believe it has a lot of significance for our relationship. What’s the most romantic thing you’ve done for your girlfriend? Me? There are some things. One day, around the time when I started going out with Sofía, I was on vacation and I had to go to Brazil. I was there for a couple of days, and then I returned to Portugal. Then I went back to Brazil again, then back to Portugal. And when I went to Brazil for the third time, that was when I told her, you have to come with me, because I can’t be without you now. She was studying for the university entrance exam, and when she finished with it, we took a flight and went to Brazil. So you had to travel like Willy Fog in order to get her. (Laughs) Well, I did some things… she’s a woman that I love and who is always there for me. What does it mean to have that that special someone by your side, someone important, someone that supports you in the good and bad moments? It’s important, no? I’ve done many good things, just like I’ve done some not so good things. And Sofía has always been by my side during those not so good things. She never agreed with me when I did bad things, she always told me I was wrong, and I had to change. So I’m very thankful to her, she’s an important reason why I’m here in Madrid today, why I can triumph in Madrid. She’s special, but so are you. I always say that people don’t know the real you. Why do you think people have an impression of you that has nothing to do with the reality? Well, because on the field I’m a completely different person than the one I am off of it. On the field, I try to help out my team, I do everything I can to win the game. I don’t like to lose, I give it my all, and I care very much about what I do. I treat each play as if it were the last one to win and help my team, and many times people interpret this in a different way. What is Pepe the person like? 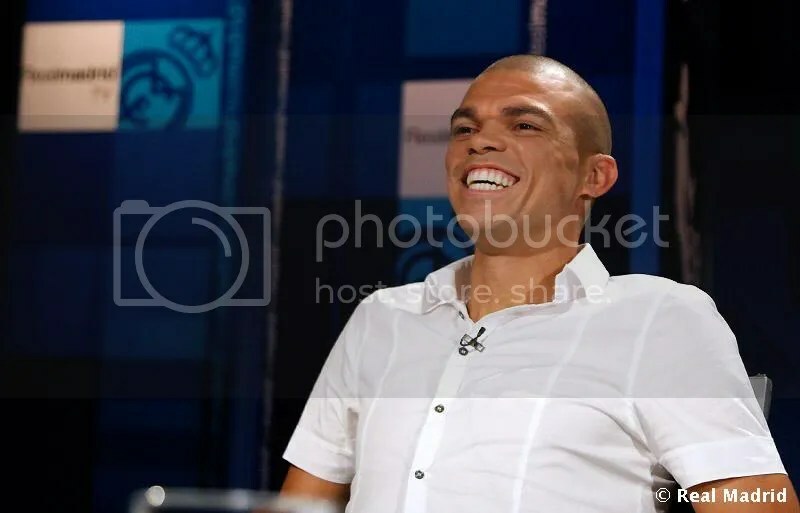 You spend the entire day laughing, and it appears there’s never a bad day in the life of Pepe. No, I’m privileged, no? I’m a very happy person, and I’m very grateful for that. I’m also very family-oriented, I love spending time with my family and friends. I believe that in life, family and friends are the most important things, so I try to treat the people around me well, because they’re the ones that inspire me and give me the strength to continue down this road. It’s… (laughs) true. I don’t like being serious, I view life with a lot of joy and humility as well. One thing that I have very clear in my mind is that behind a smile, there is always a person with something good to offer you. What’s left in the adult Pepe of the kid Pepe who was born in Maceió, Brazil? What’s left? The humility, I believe the humility. For me, that’s the most important thing. My parents always told me when I was starting my football career that humility was the most important thing. That’s what makes me a better person. I remember that one day my father called me when I got to Madrid and he told me that nothing has changed in my life, only my job, so I have to continue being the same person as I was before Madrid, so that I could be in Madrid for many years. I saw some pictures of you as a kid. You’re the same as you are now, just better looking. You have the same face, the same smile, but you’re just a bit stronger now. What were you like as a child? Very, very restless, I liked to spend time outside. My mother suffered a lot because I was never at home. I was always out with my friends, I would always go to their houses. I was always playing, doing things that a normal kid my age would do. Thanks to God, I had a great childhood with my friends in Brazil, and later I went to Portugal, which for me was also great. Growing up, we have great memories of the neighborhood in which we grew up, between the plazas or the football field where you took your first kicks. What was your neighborhood like? A very humble neighborhood, where everyone knew each other. It’s a type of “papagayo,” I don’t know, a “papagayo” [a large kite], there’s a string and the wind keeps it in the air. I really liked playing with this, though my mother didn’t like it very much because it was a bit dangerous as it could get caught in the electricity cables, so my mother was always afraid but I loved it. What was your group of friends like? Who were they, your constant companions when you were young? I liked Everthon a lot, a boy who studied with me. Then there was a boy named Toro, who was a great friend of mine as well. I had another friend named Marcelo, we were always together, joking around, going to school, studying. We would spend practically the entire day together, joking around and playing football. [So nothing has changed! Now, he still has a friend named Marcelo with whom he spends practically the entire day with, joking around and playing football.] I have maintained these friendships to this day. What are they doing now? You’ve been privileged enough to become a professional footballer, but what are they doing? One is working as a security guard, another doesn’t work. In Brazil, it’s a bit difficult, but the most important thing is being healthy, and later on things will happen. The most important thing is to be happy, and if one day I can help them, I’ll do it from the heart. What was the first football field that you played on like? How did you first start kicking others? No, because when I got home, I had a ball there and I would kick the ball against the wall to get stronger, so I would be able to shoot like that during the games. It’s true. It’s strange, because no one in my family was a football player. My father was a coach, and got me a tryout with a team in my city. So I went there, and even though I was very young, I was very responsible and disciplined. So everything the coach asked of me, I did. I would always stay extra time to practice, and they liked my attitude, and told me to stay. And so I did. Yes, I liked it a lot because I liked doing the exercises that my coach told me to do; they were exercises to improve your vertical leap and speed, and I loved doing them. And later on, when I went back to my neighborhood to play with my friends, I was much more prepared than they were. I could jump higher and run faster than they could. I would work on my speed on the sand, and on the vertical leap in the water while wearing ankle weights. That’s the secret that I wanted you to tell… weights on your ankles? We put them on in the water and we would jump. Outside of the water, we would do the same, with and without weights. And that’s how I developed the vertical leap that I have. One of your secrets is this powerful leap that you have. I was 12 or 13 years old, and it was very important for my formation. For me, my father and my family have always been the most important things in my life. My father would stop working to take me to the training sessions and games when I wasn’t able to go by myself. My father, my mother and my sisters would always come to watch me. In the beginning, I was a bit embarrassed, because it wasn’t normal to have the entire family there. But I got used to it, and after the games, we would go to the beach and walk around. My father would buy me ice cream and say, today you deserved this because you played well. That left me very happy, because at that time, getting praise from my father when things went well was very important to me. I am, I am, very much so. You need to have the people that you love around you. Yes, because as I said, I believe that one’s family is a very important thing and a fundamental base for any human being. My father, my sisters, my mother, and now my girlfriend are people who know how I am, who give me strength and in them I have the strength to always continue forward. How much influence has your family had in you becoming a professional footballer? A lot, a lot. At one point in my career, my mother wanted me to study, and I had to choose. Later on, when I was playing, I saw some things in football that I didn’t like, I saw many injustices, so football was making me a bit sad. I returned home, and I told my mother, I’m not playing football anymore. She was surprised, and asked why, what happened to you? I said I saw some things that I didn’t like, that went against my principles, and I don’t want to play anymore. And my mother said, no, no, no, now you have to play football, because that’s what you chose to do, and you have to continue going forward with it. Yes, I studied that for one year, I had the opportunity to finish 12th grade and enter into the physiotherapy discipline. What was your first serious team like, when you had to train, play games during the weekends? It was in Segibe, the club of my city, where I had my first tryout. They paid my transportation costs so I could go to train, and for food. We trained twice a day, and it was there that I saw how important it was to be a player. It was an important club as well, because it was this club that started me training on the beach, that gave me the opportunity to play important tournaments in Sao Paulo, and that contributed to my development. You’ve told us that you came from a very humble neighborhood. Is it true that you exchanged the tickets they gave you for transportation for food, and that you went to the training sessions on bicycle? Yes, it’s true. I had a friend who played with me, his name was Marcos. He lived close to me, and we negotiated with the bus driver. The club would give me two tickets, one to get there and one to return. We were a bit hungry, and I said, look, I have a ticket, I’ll change it for a plate of food, which in Brazil we call the “plato del día.” We shared the food, and there was only one piece of meat, so we would ask, we’re sharing, can you give us another piece? Today, I still have a lot of affection for this person, because he shared these things with me, he was always there for me during both good and bad things. I’m very proud to have shared these things with him. I got up at seven in the morning, no six, and I had to be there by eight. My father left at 06:30, and I would go with him. I would get home around six at night from training, 5:30 or six, and go to school at seven. I would have to go home, change, get my bike… when I arrived at school, I was dead, because I trained in the morning and the afternoon. I fell asleep many times. You really were restless as a kid, because in addition to training, going to school, studying and riding your bike, you also had time to raise fish and birds. What didn’t you do? It’s because I knew what a difficult time my parents had, so I found a way to help my mother, so I could buy bread and contribute to the household. So I made a fishpond at home, and as for birds, I had birds, chickens. My mother asked, why are you doing this, and I said, calm down, I’m doing this because I like it. And later on, I would sell the fish – they were beautiful and also expensive fish. With this money, you helped your family. I helped my mother to buy bread, and things like that. That’s a nice thing to do. I think it was more of a necessity than a nice thing, since we would do anything in order to be able to eat. You should never overlook others and you always have to be honest. It’s something that I value a lot. Did you ever go hungry? Or were your parents able to avoid that, or even you yourself with your initiative to raise fish and birds? The circumstances weren’t easy. I never went hungry, but there are many things now that I wasn’t able to eat when I was younger. We had a different type of food back then, since there were things we couldn’t afford to buy. But I never went hungry, because my parents always worked hard, and my mother made a big effort to raise us. Before she went off to work, she would always prepare food for the four of us. The four of us had to take care of the household. My mother left the house at four in the morning to go to work, and I would be at home with my sisters, until 15:30h or 16h when my mother returned. Each one of us had our own chores for the house to maintain it and to be able to eat as well. Yes, my father always told me that when he wasn’t at home, I had to take care of the four women, my mother and my three sisters. And my father always said to me, whatever you say is also my word, so be careful what you say and do. If you’re doing something bad, then I’m doing something bad. I hope you don’t disappoint me. That’s why I always tried to do things in a way that I knew my father would like, and what I myself believed was the most correct thing to do. Isn’t it great to be able to return to your family everything they gave you when you were growing up? Without them, you might not be where you are today. Yes, it’s true. But it’s not just about money, it’s also about the affection. Thanks to God I have wonderful sisters, wonderful nephews and nieces, wonderful parents. I will always do whatever I can for them. I’m willing to give up my life for them, because… I remember when my mother stopped working, I was just starting out in football, I was 13 or 14 years old. I was just beginning to earn some money, and I told my mother, don’t worry, I’m going to become a football player, and from now on, you’ll never work again. And everything I earned back then in Brazil, I gave to her, so I could help out the household and my sisters too, whether it was to buy them clothes or make-up. And my sisters, when they started working, they also did everything they could to help me out. And later when I went to Portugal to continue to grow as a footballer, my mother told me, go to Portugal, but if things don’t turn out, you can always come home, the door will always be open to you. And that was a great source of strength for me. Yes, because those are things that happened in our lives and that made us what we are. There were many times when I cried. There were times when I was alone in Madeira and I was sad, but when I called home, I had to tell them that everything was good, in order not to worry my parents and my sisters. But these are things that happen in life and that make you mature and a better person. What is a piece of advice that your parents or sisters gave you that you’ll never forget? There are a lot of them. There’s a lot, because they always gave me advice, for both good and bad things. But as I said before, my father always told me that I had to protect my family. He said, you always have to protect your family, you always have to protect those people whom you love, and to always be a good person. My parents and my sisters always said this. Yes, I still had two games left in Brazil when I signed my contract with Marítimo, about a month before I was to leave. My last game in Brazil was on a Sunday, and on Tuesday I was to leave for Portugal. Unfortunately, in the last play, I think it was the 88th minute, a tackle left my foot pinned to the ground and I broke my ankle. I went to the hospital, and they wanted to operate on me, but my mother said no, no one is going to touch my son, he’s only 17. So I had to get a cast, and I had to wear it for half a year. They gave me a lot of medication, but I recovered on my own, with a good diet and a lot of care. How much time did it take you to recover from that broken ankle? Six months. Well, five months, but it was six months before I started playing again. I got to Marítimo, and I did physiotherapy there. The doctor there told me I should have been operated on, but since so much time had passed, it wasn’t necessary anymore, since the bones had healed nicely. After that, things happened very quickly. I had gone there to play on one of the youth teams, and I played two or three games with them. Then I went to the second team, and I think I played 11 or 14 games with them. Then the míster of the first team called me and the other central defender up, with four league games left to go. One of the centerbacks was injured, another was sanctioned, so the míster called my teammate and I up from the second team. That was on a Monday, and he told us we had until Thursday to prove ourselves, to see which of us deserved to play. At that point, I said, that position is mine. I did my best to show that, and I was disciplined. The training session would end and I would stay with the coach to talk about what I needed to do. 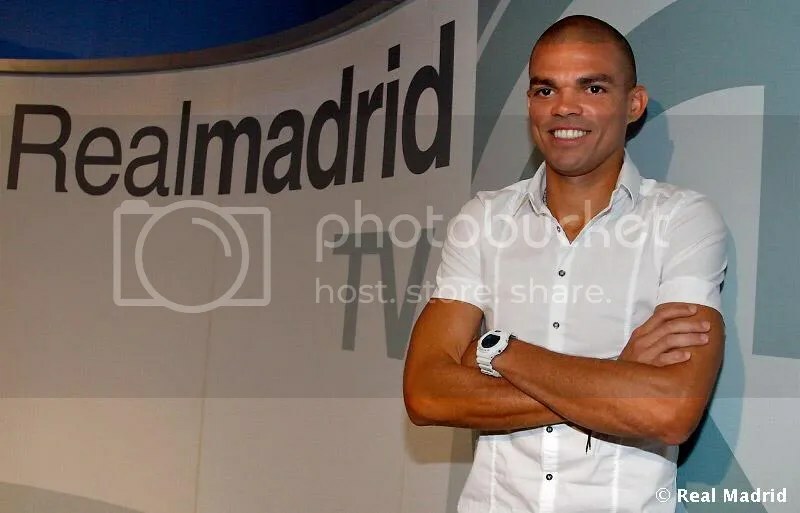 On Wednesday, the míster called us in and said the only one who has shown that he deserves to play on Saturday is Pepe, and so Pepe is going to stay with us. The other boy returned to his team. From that point on, I remained on the first team and I played the last four games, and it was wonderful. Perhaps the hardest time in your life was those first months in Marítimo, when you were injured and alone. You had a bad time of it. Yes, yes. Those were two bad things for me, I didn’t know anyone at Marítimo, I didn’t know anything. I had left a very humble neighborhood for Europe. Portugal had an entirely different culture, although the language was the same. And then later on, when I was already at Madrid and I injured my knee. Those two moments have marked my career and made me grow. What did you learn during these moments? To value life a lot, to value the moment, to value the people close to you, to not heed the bad things that others say about you. There will always be people that you don’t like, who wish bad things on you, who always want to hurt you. Before, I would think a lot about these things, but now I see football in another way, a more coherent and tranquil way and I think that… well, I think I’m good. After triumphing in Marítimo, you went to Porto. That’s where you must have thought, things are serious now. Yes, as I said, I played those last four games. Sporting (Clube de Portugal) wanted to sign a centerback, and that’s when I met Cristiano. I went to Sporting, and then when they decided they didn’t want me, I left (back to Marítimo). That’s when the president of Porto called me and said, “don’t worry boy, if you continue working hard like you did in the last four games, we’ll sign you.” And I was so happy, because it was Porto, who had just won the UEFA Cup. What I wanted the most was to play for Porto, because I knew that I was going to win titles, that it was the team in Portugal that won titles. 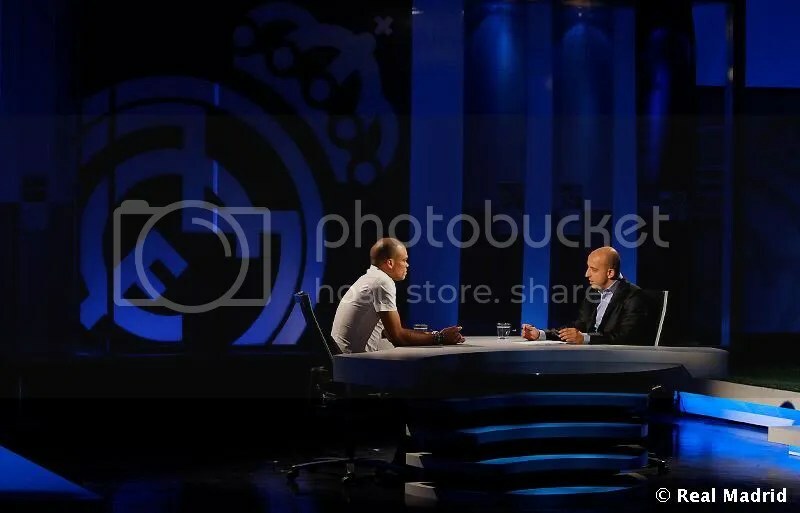 So I worked very hard, and when we played against Porto, I had a run-in with Deco, but the president told me that he liked the way I play, that I had to play in Porto. So I went to Porto. There were other clubs in Europe that wanted me as well, but I only wanted to go to Porto. Many teams in Europe had their eye on you, and you chose Real Madrid. What does it mean to you to play for a team like Real Madrid? It means a lot to me, a lot. I watched Real Madrid when I lived in Brazil. We would exchange things… no, not trading cards. For example, I’ll give you fish if you give me a shirt. I got a shirt of McManaman that way. There was a boy who had one, and I always wanted to have a Real Madrid shirt, because I thought it was really beautiful. How many fish did it cost you? I don’t remember, but it was a lot. It was some of my best fish, but it was worth it, because from the time I was small, I would always watch Real Madrid’s games and I liked them a lot. Through your hard work, you’ve gained the affection of the fans and your teammates, the respect of the institution, and then a contract renewal. What does that mean to you, did it make you think that they have confidence in you, that you’re the future of Real Madrid? It means a lot to me, because everything I did to get to this point, the day of the renewal, I did with the maximum amount of affection and I gave it my all to help Madrid. And the day came when I was able to renew my contract with Madrid. It was quite important for me, and it made me very happy to be able to sign a new contract with Madrid, because I love the people who work for this club, my teammates, the directors. I believe I’m at the best club, the best one as an institution, it’s the biggest club for me, the people who work here, my teammates and the directors, are the best, and so I’m at the best club in the world. You also like the city a lot, Madrid, being at home with Sofía, and your brother-in-law Jorge is a great guy. We have to say that part of merit for your happiness in Madrid belongs to Jorge. He’s always with me, he goes to the training sessions… He’s a very patient person, because before, he could watch the training sessions, but not anymore. But he continues coming, because he loves football. I tell him, I feel bad saying this but you have to stay at home, even though you’ll be alone there, but he’ll say, no, I’ll come, I like being there, I like being with the people that work in the club like the security team. He loves being here. It’s true. When I got here, I had the opportunity to eat at the Ciudad de Fútbol (the headquarters of the RFEF) in Las Rozas. He gave me one of his shirts, and it’s in my museum. I also have some gloves from Iker, which he gave to me during my first year here when we were champions. These things have a lot of significance for me, and are very important to me. Let’s talk about Pepe the person. What do you like to do in Madrid after the training sessions, when it’s time to eat, during the afternoons? I’m told that you love going shopping, to the supermarket, with your little cart… Movies? Outdoor cafes? Yes, I love the things to do in Madrid. When I’m very tired, I stay at home. But when I’m rested, I go out with Sofía, to enjoy life. I like to be in contact with regular people, which is important to me. When I’m out on the streets of Madrid, it reminds me of Brazil, because everyone is always talking and living their lives out on the streets. I really like these types of things. And then I like shopping, I like to go with Sofía, to go shopping, to buy things for the house, such as cleaning supplies, things like that. That’s why I have to give a lot of credit to Sofía… when I left Marítimo and went to Porto, there were one or two years where I practically never had to fly, because we always went everywhere in Portugal by bus. We only had to fly to play Champions League games. And now in Madrid, we have to fly almost everywhere, and it scares me. Have you had many scares on airplanes? [Pepe doesn’t tell the story very clearly, so to me it doesn’t make any sense]. Yes, many. In Madeira… ¡ufff! A lot. We left Porto for a game, and it was more or less midnight. The airplane tried to land, but it hit the ground and went up again. It made a loop to make another attempt, it landed and tried to brake, but it couldn’t do it in time, since the runway ended in the ocean, so it lifted off again. So we flew to another island next to Madeira, Porto Santo, until the wind and weather conditions were better at the airport of Madeira. We tried again for the third time, but we couldn’t and we had to go to Lisbon. Everyone on the plane was screaming and crying. And we went to Lisbon because there was no fuel left. We’re going to tell a secret to the people who are watching. What is your dream for when you retire as a football player? My dream, no? My dream is to open a clinic. Sofía is studying medicine, and since I started studying for a physiotherapy degree, we would like to open a clinic to help people and those types of things. I believe… well, there’s a lot left to do, but it’s something that Sofía and I have in mind, and she’s working very hard to finish her degree in medicine, so that we will be able to follow our road. Marcelo said another of your dreams is to go around the world in a caravan. I’m imagining Pepe and Marcelo in Thailand in a caravan… [maybe they went to visit Guti!]. I like highways, and as I told you, my father was a driver. I’ve always told Sofía that I would like to have many children, and go with them in a caravan through Europe, around the world, to learn about everything. I really want to do this, and I hope one day to realize this dream. Cristiano and Marcelo sent me a message for you. Something like, it’s “bafao.” What does that mean? They’re horrible, but they’re your friends. Tell me. Cristiano told me, say “bafao” to him. And Casillas is involved too, no? There’s a really good atmosphere in the locker room, no? Very, very good. We have a great team. As I said, I believe Madrid is the biggest club, we have the best players, and right now Madrid has a very strong team that will contest all the titles. We have the players for this, and we’re showing in each game we play that we’re good, and that this team is quite humble. Yes, because many people envy Madrid, so they say things like that. I have no problems with Carvalho, it was a situation that Carvalho went through on the national team, and Carvalho continues to be my teammate and friend, and a person for whom I have the utmost respect, because what he’s accomplished in football is a great thing, and he’s still doing that in Madrid. He’s an exemplary person. Anyway, Carvalho went through that and we have to support him, because he’s a human being and we have to respect that. What people don’t know is that you always support those who need it, whether they’re one of the “top” players, as the míster says, or one of the boys. When there’s a problem, when there’s an issue, do you always try to talk with them and help out? Yes, that’s what they did for me. I try to be like this too with people. There were always important people who would come and talk to me when I was going through rough patches, and also when I was a boy, so I try to do this with the canteranos and with people who have been here for more time. I try to help out because if Madrid is good, then I am too. If we follow this path, we have more possibilities to win more things. You’re one of the heavyweights in the locker room. What sensations are you feeling from Real Madrid this season? Very good ones. The truth is that in all the time I’ve been here, this is the year I’m most excited about, because we’re feeling good, we train well, and as I said before, we’re a family. We understand each other very well. If anything happens, we always have our friend next to us to give us a hand to help us out, and that’s very important in a club and an institution like Madrid. Yes, Mourinho is a person who knows us very well, he knows what to do to bring out the best in each player, and he’s very involved with Madrid every day and every hour. How did you manage to forge this connection between yourself and the Bernabéu? How did you get the Bernabéu on your side? Is it the passion that you talked about, that for you, in every game, every ball is the last one? Because the Bernabéu adores you. The people on the street adore you. They always say that. You must notice the affection from the fans. It’s true that the fans treat me very well. In the beginning, when I just got to the team, my first year, the first two or three months were difficult, because the people didn’t know me. And later on, when I showed my dedication to the club, they recognized it. Today, they have a lot of affection for me, and I am grateful to the entire madridismo because people have treated me very well, especially when I most needed it. We’re at the start of the road, the beginning of the season, so perhaps it’s a bit too early to start thinking about Cibeles. But have you dreamed about going to Cibeles this season? I dream about making history, because we want La Décima, and the Liga as well. I believe Madrid right now is a club that is prepared to fight for all the titles, and we have to always stay like that. We’re going to fight a lot, there will be difficult times, but we’re prepared for everything. What is your wish for this season on a personal level, and on a team level? Well, on the personal level… I always put the team first. And the personal things come after that. If the team does well, then my friends and I will also do well on a personal level. We protect this with our body and soul, which we’ve shown in the games we’ve played this season. We’re a very strong team and we’re going to follow these same lines so that in the end, every footballer will achieve his personal successes. I believe that if Madrid wins, we’ll win a lot more. Many madridistas, many people around the world are watching. What would you like to say to everyone who is watching now, who is excited about you, about this project, about these football players, and who have the feeling that something big is going to happen this season? Well, I have a great memory of something from the (Supercopa) final last year, against Barça. I really felt what el madridismo was. The people there with us… I believe that’s the spirit we have to have. There are many people who are envious of Madrid. If we unite – the footballers, el madridismo, the directors – we’ll be stronger and no one will be able to break into our family and push us off the road. I believe we’re in a good moment, we’re on the right track, because I feel the support of el madridismo. If we continue like this until the end of the season, we’re going to have a lot of joy. The interview wasn’t that difficult, no? No, no it wasn’t at all. I noticed that you referred to me as “usted” (the formal “you” in Spanish). I had to do that. You know, for many people, “usted” are the number one centerback. And I always say one thing, that I hope as a result of this interview, people realize that you’re number one as a centerback and a 10 as a person. Thank you. I love love love this interview! It puts a smile on my face. So many stories in such a short lifetime. It only now occured to me that him, Marcelo and Cris not only hang out because of language issues, but also because they understand each other’s past very well. They aren’t just silly pranksters (though they are too!) they have had profoundly difficult pasts. Of all the interviews, this is my favourite. 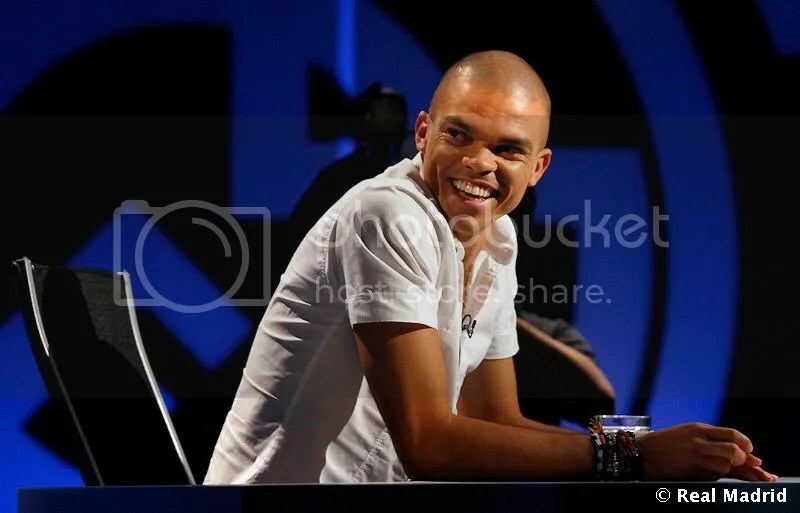 I loved Pepe – now I really, really love him. Thanks Una, I love those interviews. Now I feel like I know so much more about Pepe. The ancedotes about his childhood were great.And yes, Óscar Ribot seems to knows lots of things about the players and hangs out with them, lucky guy! 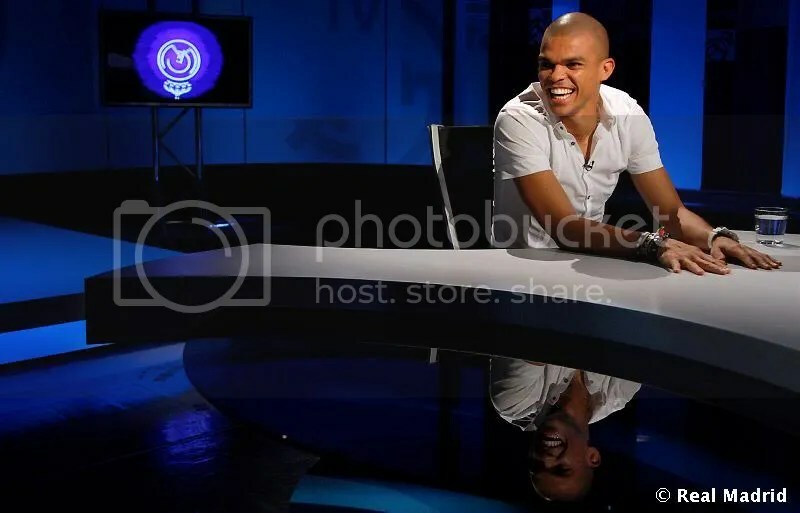 These kind of interviews that I love….it showed the personal side of pepe just to show to people you know this guy is not a thug…he is doing his job! Thank you so much for posting this, Una. It was great to hear more about Pepe the person and of his life in Brazil. I love him even more now! 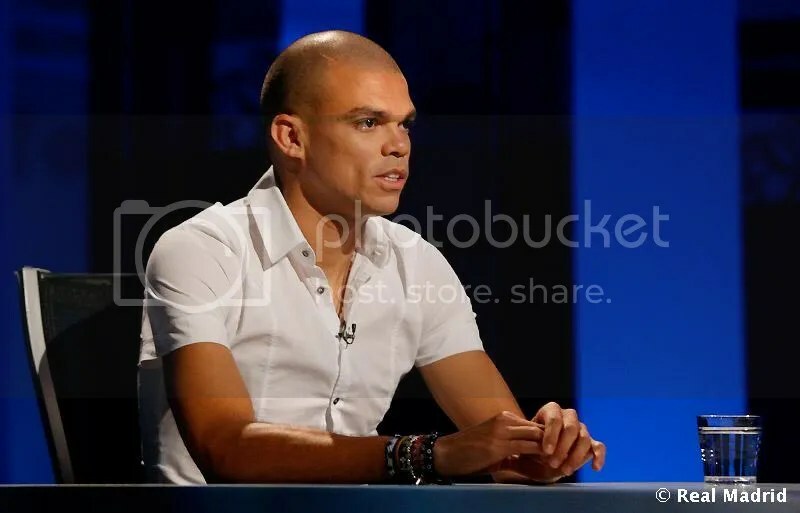 Pepe is so wonderful – I felt very tearful at times reading this interview. What a beautiful personality. 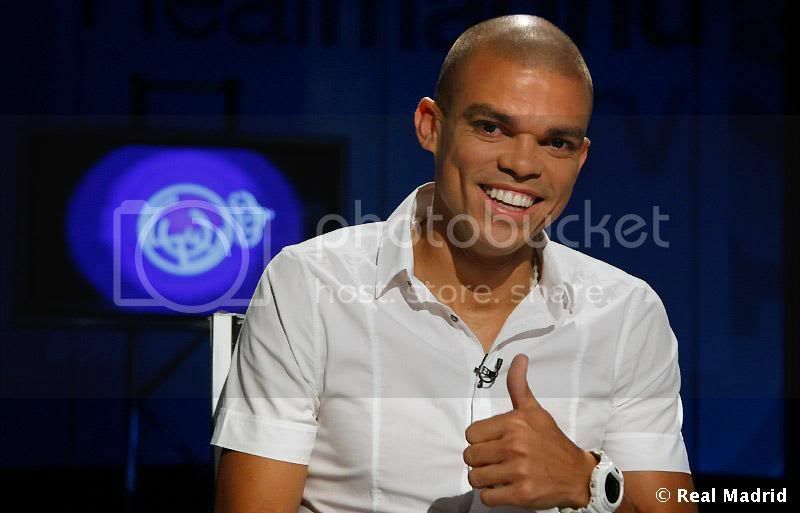 Pepe is brilliant! This is one of the best episodes of the Real… series, I did really enjoy it. And the lenght of it…OMG… it must have taken forever to translate it. Much appreciated Una. I can’t imagine that RealCarvalho will be as interesting, because I don’t think that Carvalho is the type of person who is willing to share special moments and anecdotes with the people. I hope he’ll prove me wrong, I would love to get to know the oldest member on the team a liitle bit better. The way he spoke about his family and childhood brought tears to my eyes. He may be from “humble” beginnings, but he was lucky to have such a close, loving family. what an amazing interview! 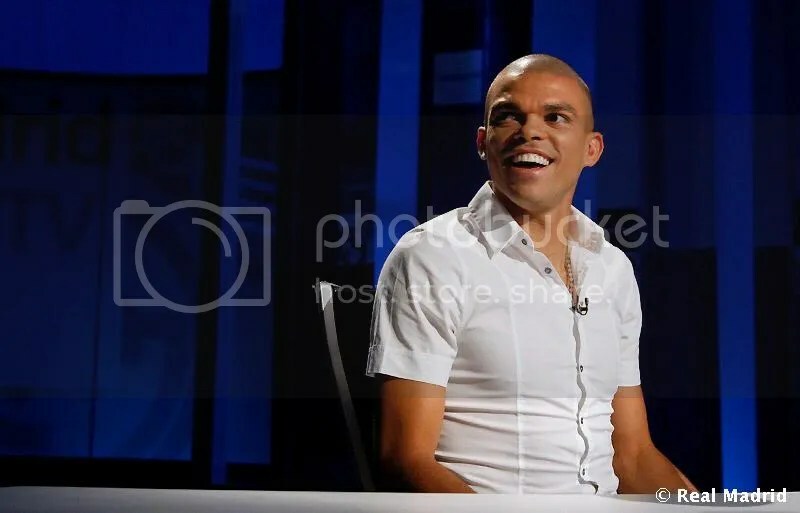 Seeing Pepe’s personal side isn’t something people do often and this interview is a true eye opener. Wow, this has to be my favorite interview from this series. What a moving, inspiring story Pepe has! I love his dream of making a clinic and healing people. Thank you so much Una for all the time you put into these! I love Pepe my favorite part was the fishpond part. 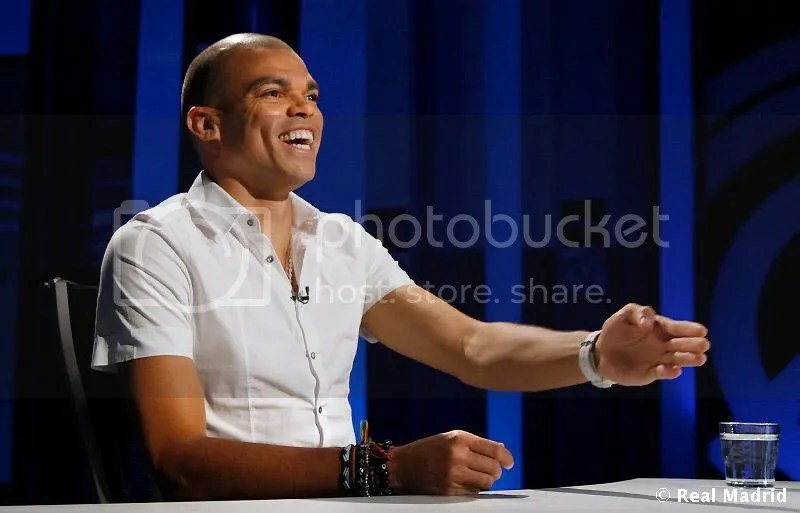 Ah and the Carvalho interview, i think i had a smile the entire time he is so adorable when he said ” me enamore y sigo enamorado ” talking about his wife and the smile that came to his face when he was asked about his kids. There are just way too many things in this interview that I love! I especially loved the part where he talked about getting support from others when he was having a rough time and how important that was to him. So now he pays that forward to the canteranos and others. And how sweet is it that he talks about Sofia so much?! “I told her, you have to come with me, because I can’t be without you now.” Okay that is totally and “awww” moment! I really love these Real interviews. We get to see the off field side of these guys. What a great team they are!